Although the Thames has subsided quite a lot since the worst of the floods earlier this month, it is going to take some time for the waterlogged soil to dry out. This was the scene at the local rugby and cricket club this morning. 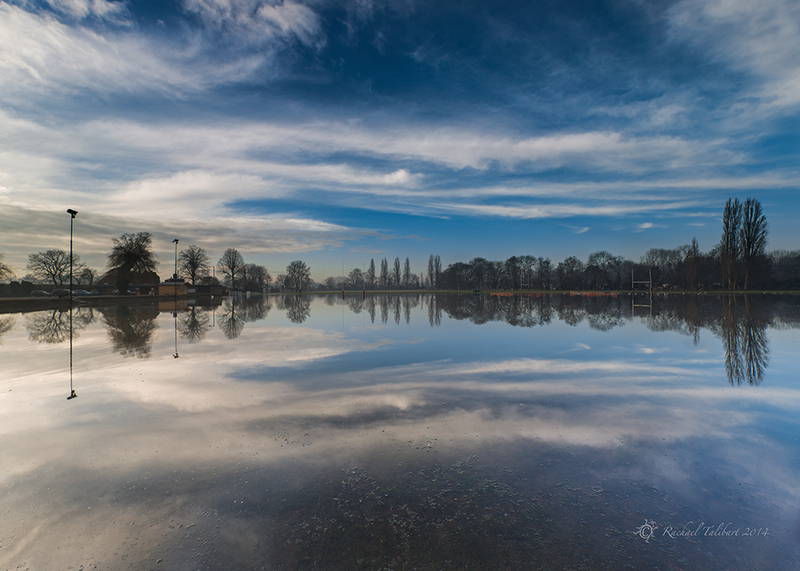 The standing water makes for some pretty reflections, but not much good for playing! Still, there is improvement; I couldn’t have stood in this spot last week. 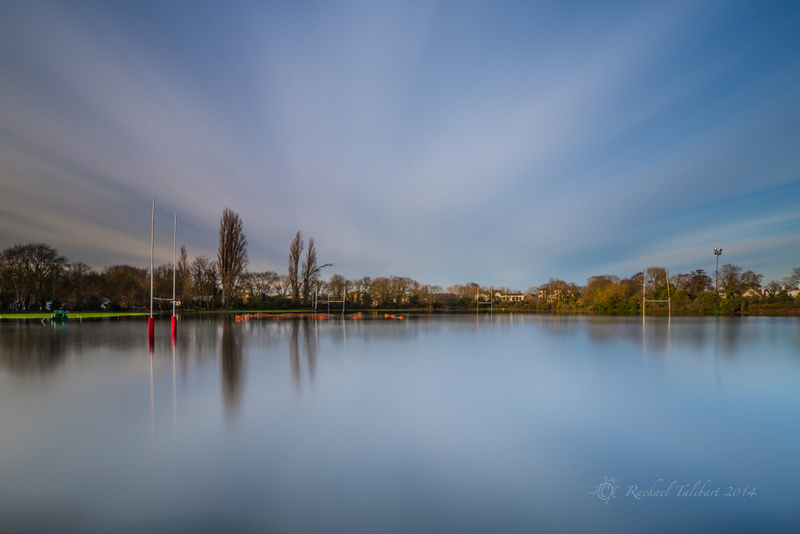 This entry was posted in photography and tagged cricket, desborough island, floods, landscape photography, photography, rugby, Surrey, Weybridge Vandals by Rachael. Bookmark the permalink. Unfortunate that the picture-perfect reflections had to be under such circumstances. Indeed. All very nice for photogs and waterfowl but no one else really. 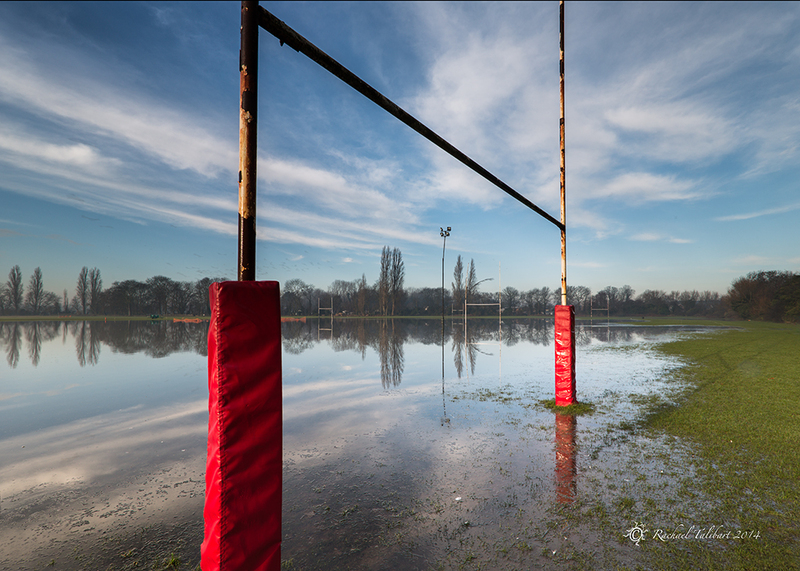 “Real” rugby players would revel in the challenge! That red against the blue is most eye-catching. A super set that together clearly illustrate how it’s been. 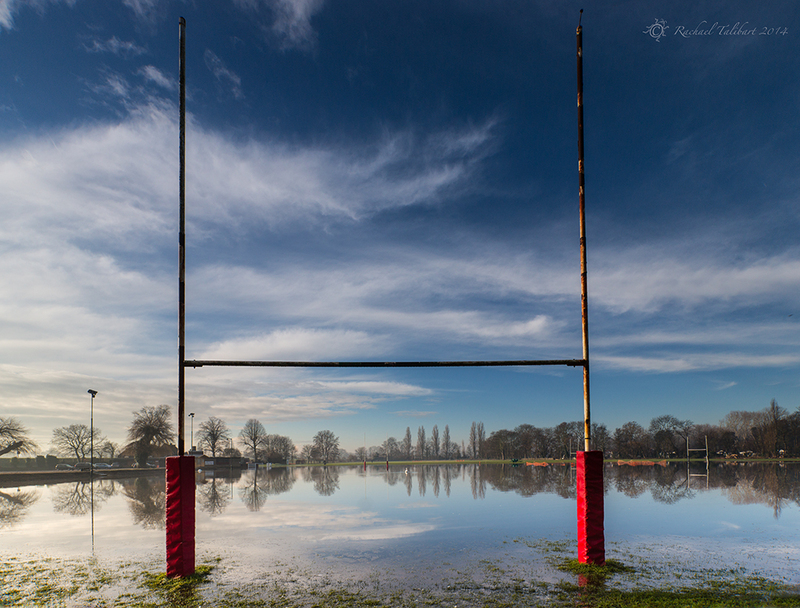 The water and reflections make for some gorgeous shots, but not much fun for the sports fans or players. It seems as though you’re stealing all of our rain. We’re supposed to get flooded around here and we’re experiencing a record breaking drought. Not for the first time, I wish we could share our weather out between us! The reflections, especially in the first photograph, are beautiful. The reflections are beautiful. Awesome pop of red from the rugby stand. Did you use a lens filter for these shots? Cripes. Flooding here on the Gulf Coast USED to be a regular occurrence. Not-so-much in the past few years, perhaps the rains have moved away, gone to Europe. You have a knack for making beauty out of muck. Not surprisingly, you’ve taken wonderful shots of your environs here, even in unkind situations.